Late summer is one of my favorite foodie times of the year. 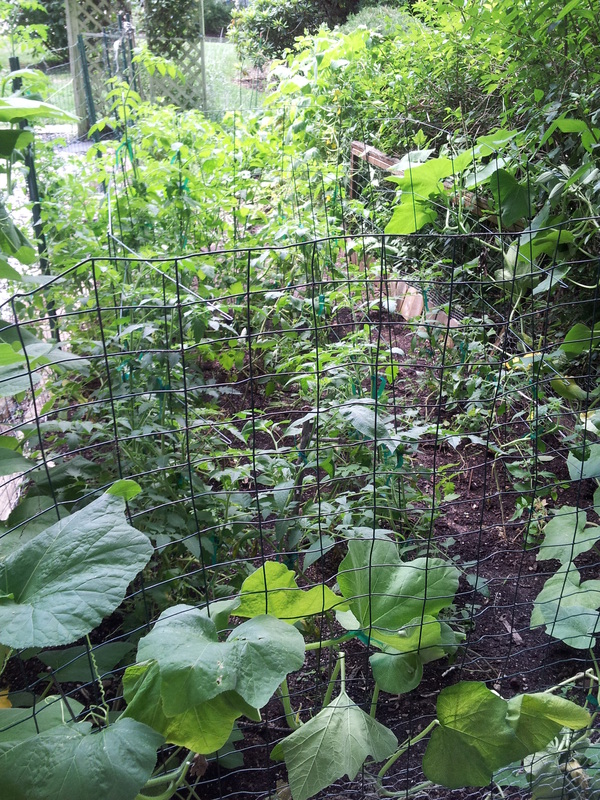 My local farmer’s market is overflowing with a variety of colors and flavors, and my little organic garden is lush and happy (although I do find I am sharing more and more of my harvest with little critters that like to help themselves despite my fence!) 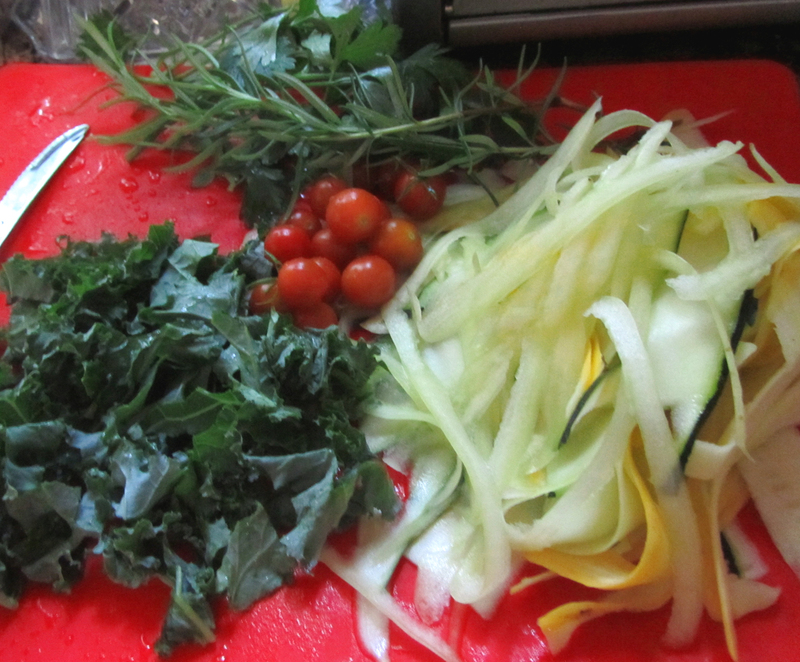 I’m cooking with fresh herbs every day, and greens like kale, bok choy and beet greens are regular staples in my diet. I’m extra excited about my butternut squash, which I’m growing for the first time. 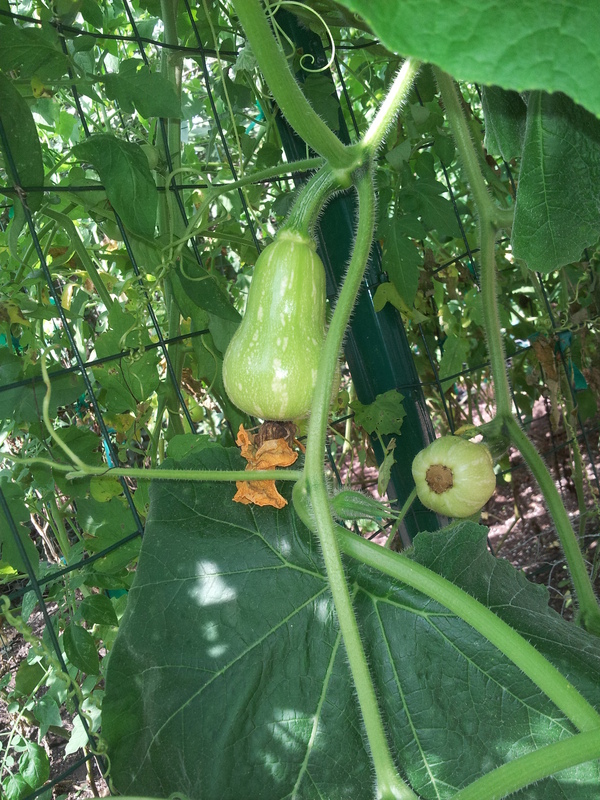 It’s such a thrill to see the squash getting bigger! And you simply can’t beat fresh-from-the-garden heirloom NJ tomatoes! This is also that time of year when everyone seems to have an over-abundance of summer squash. This recipe was born of that, and has become one of my favorites. It’s a riff on pasta, but much lighter. 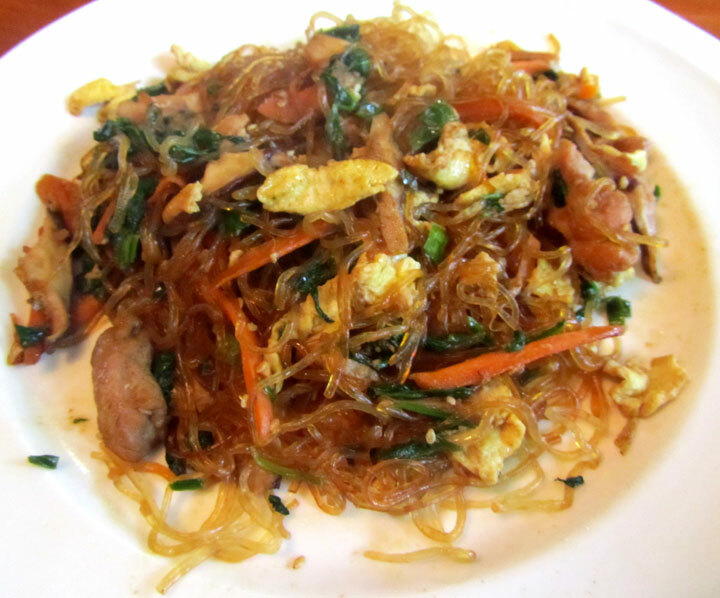 Enjoy it on its own or as a side dish. I hope you love it as much as I do! When I received the Rockcrok and read about it, I was pretty excited. It can go on the stovetop, in the oven, in the microwave (with no plastic BPA worries!) and even on the grill (it can take the heat up to 752 degrees)! 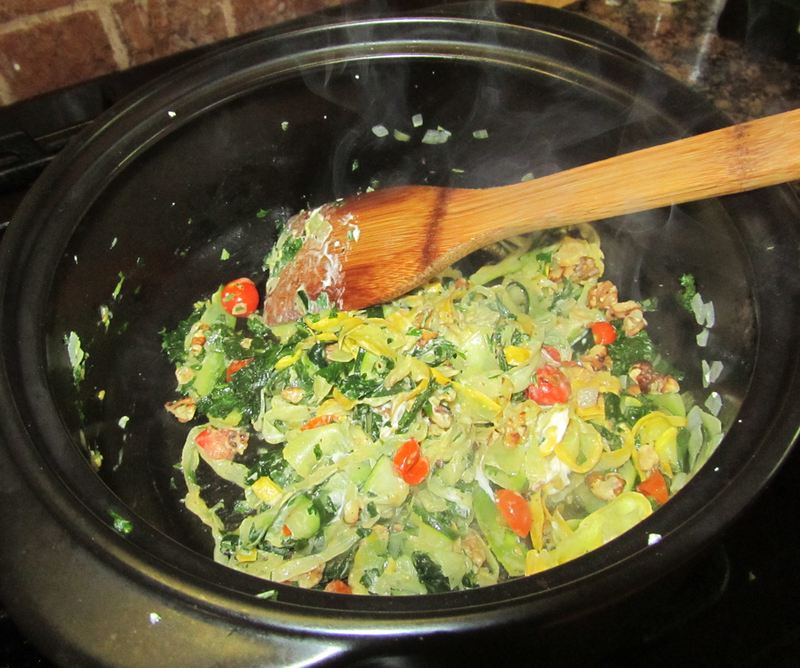 I love the fact that you can start a dish on the stovetop and then finish it in the oven without transferring pots. I found that it heats really evenly, too, which makes me think it will be great for a Korean dish I love called Bibimbop. That dish traditionally calls for a clay pot which holds the heat and crisps the bottom of the rice, which this pot should do well. 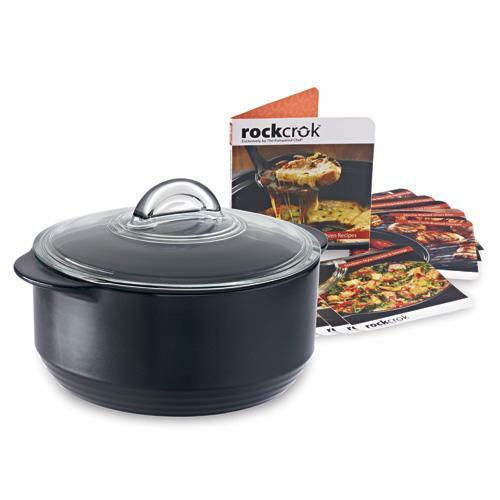 This pot is definitely one I find I use almost everyday, because it’s so versatile. So I am excited to share with you this recipe today. Please note that the variety of veggies and amounts below are suggestions. Feel free to adapt this to whatever veggies you have on hand, in whatever amounts. It’s delicious no matter how you make it! You’ll need to use a vegetable peeler to make thin slices of your zucchini, squash, pepper, and carrots. You’ll also want to chop your kale into bite-sized pieces. When the veggies are pretty soft and cooked down, add your tomatoes and chopped rosemary, along with salt and pepper. 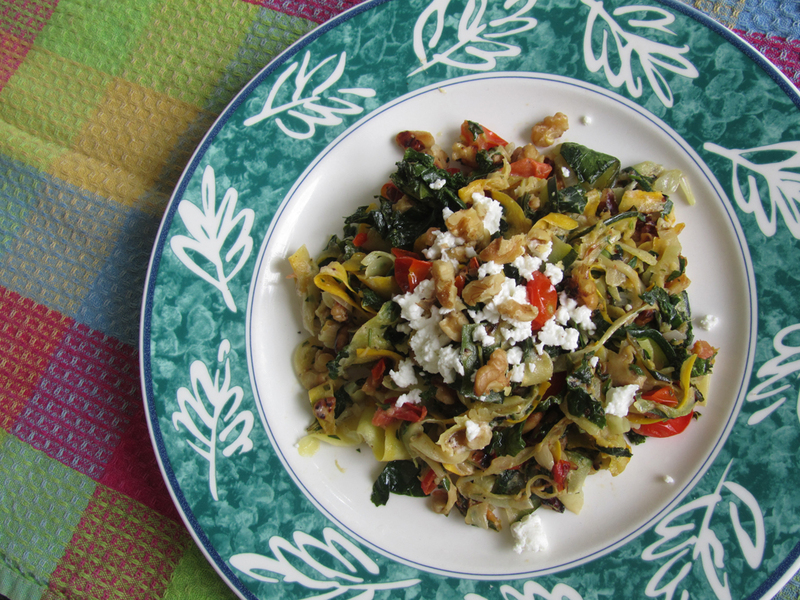 When the kale starts getting a little crispy, add the goat cheese and let it melt into the “noodles.” Top with some of the toasted walnuts. Serve on a plate topped with additional goat cheese and walnuts. Enjoy! Toast chopped walnuts in a small saucepan until fragrant and lightly browned. Set aside. 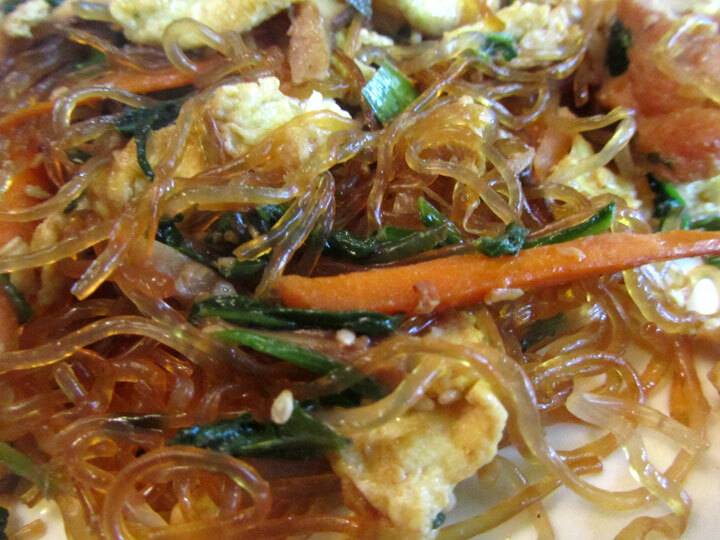 With a vegetable peeler, slice zucchini, summer squash, pepper and carrots into long thin strips. Mince onions and chop kale. In Rockcrok or large saucepan or frying pan, melt coconut oil over medium heat. Add onions and saute for 3-4 minutes, until they begin to become transparent. 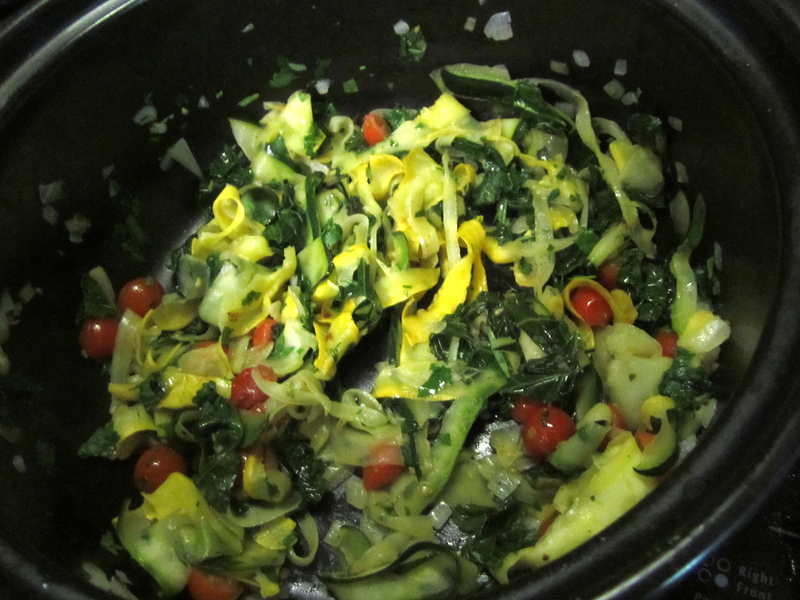 Add veggie “noodles” and saute lightly for about 3 minutes. Add chopped kale, along with chopped rosemary, salt and pepper, and continue to cook and stir for 5-7 minutes, or until kale begins to look a little crispy. Add cherry tomatoes and stir for another minute. 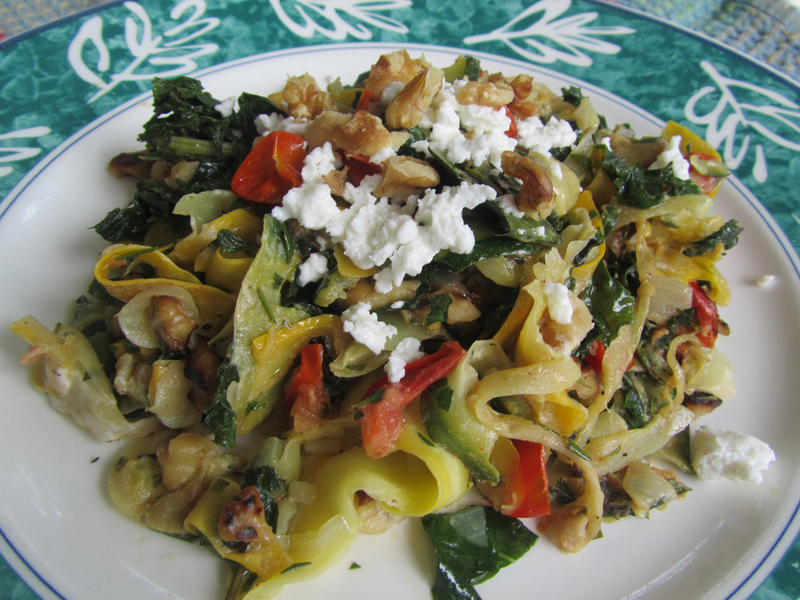 Add goat cheese and half of your toasted walnuts, and cook and stir until goat cheese melts into noodles. Remove to serving platter and top with additional goat cheese and toasted walnuts. What’s your favorite recipe with summer veggies? Please share in the comments below! I try to eat vegetables at every meal, in order to get 7-9 servings of vegetables a day. I’ve found it’s done dramatic things for my health and waistline. When it was summer, it was easy to find a variety of vegetables at the Farmer’s Market. But now that it’s winter, my options that are organic and not imported are a lot fewer. So I’ve been doing a lot of winter squash and kale. I’ve been on a big kale and butternut squash kick recently. I eat both nearly every day in a variety of ways. Green smoothies, soup, stir fries, you name it. But one of my absolute favorite ways to enjoy both is in this hearty dish that I make for breakfast a few times per week. This dish also uses cranberries, which I stock up on during the holidays and keep in the freezer. I love the way the cranberries in this dish complement the earthy flavors. So often we think of cranberry as sweet, since we typically add so much sugar to them. But in this dish the tangy, sour flavor of the cranberry adds a lot. 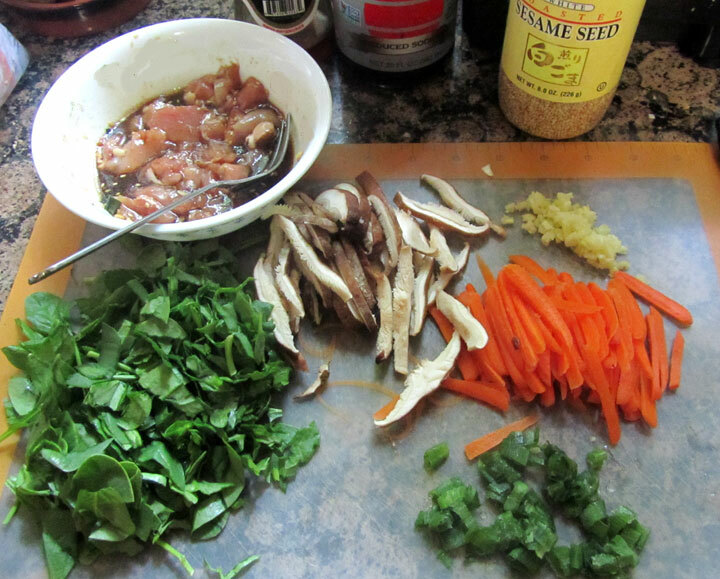 I hope you enjoy this healthy dish as much as I do! In a large frying pan, melt coconut oil. Add chopped bacon and onion, and saute for 5 minutes over medium heat. Add kale, butternut squash, cranberries, broth, salt and pepper, and saute for 5-7 minutes or until kale reaches desired tenderness. Toss in pumpkin seeds, and stir fry for 1 more minute. Wipe out saucepan, and then cook 1-2 fried eggs. 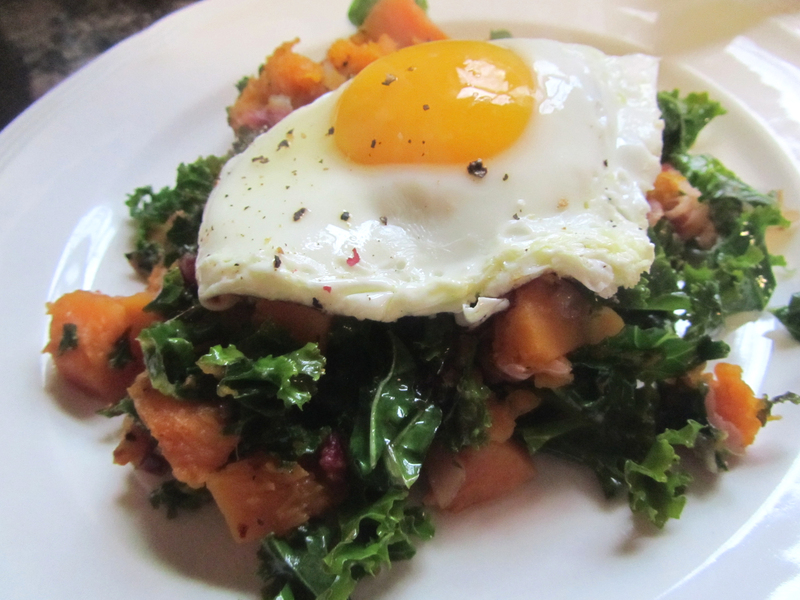 Serve eggs over kale saute. 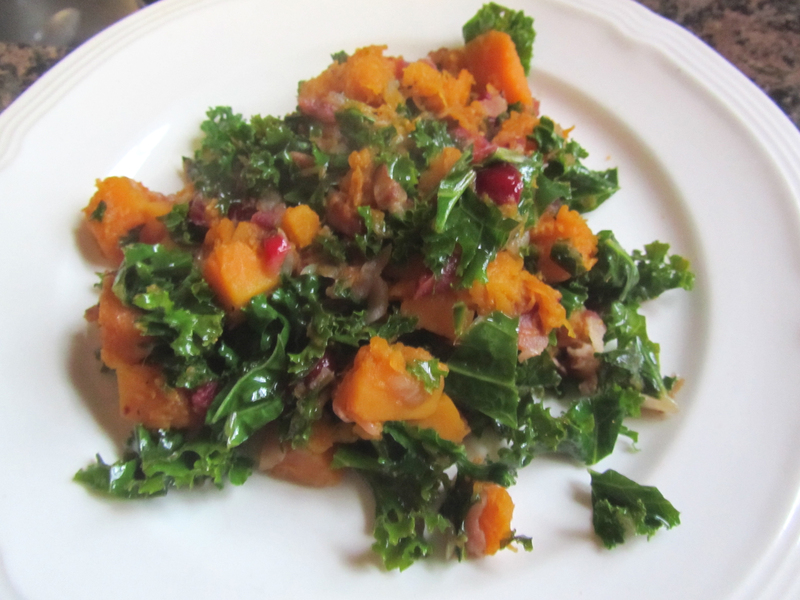 What’s your favorite way to serve kale and squash? I’ve now been gluten-free since April, and have lost 2 sizes since I made the switch. 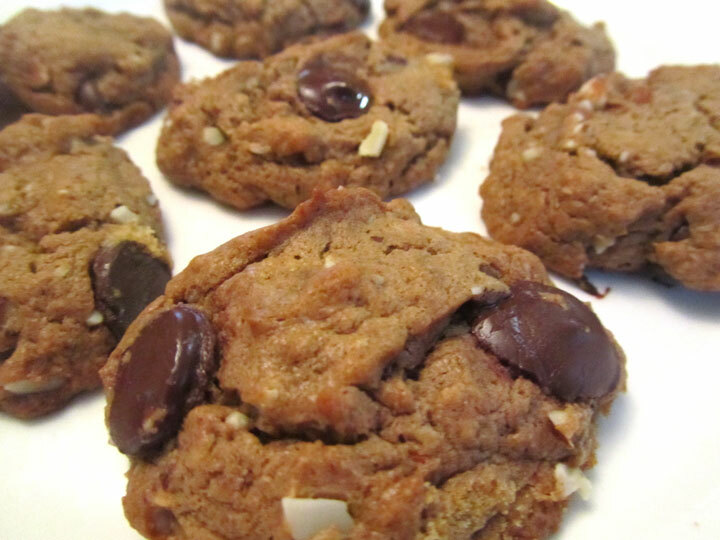 I’ve experimented with lots of gluten-free cooking and baking, and have found a lot of recipes that I really like. The toughest thing, though, is gluten-free baking. Getting the right mix of flours to simulate wheat has been tricky at best, with each combination “almost” there, but not quite. I’ve enjoyed being able to make baguettes and such, but I’m still working on a recipe that is, in my opinion, ideal. Now that the holidays are here, I was wondering how I was going to make Christmas cookies. Every year my kids and I have made sugar cookies…you know, the kind you roll out and decorate. We always leave some out for Santa. And I wanted to find a batch this year that we could all eat, that tasted as good as I remember. It starts with an all-purpose gluten free flour mix I developed. Make this first, and you can use it in other recipes as well. Combine all ingredients in an airtight container, and store in the refrigerator. In a large bowl, cream together the butter and sugar until light and fluffy using a hand or stand mixer. Add the egg and vanilla, mixing until fully incorporated. In a separate bowl, combine the flours, baking powder and salt. Add flour mixture to the butter mixture and blend on low until fully combined. Divide the dough into 2 disks, wrap in plastic and refrigerate for about an hour or until firm. Slowly roll out the dough to about 1/4″ thick, repairing cracks as they appear. The key here is to go slowly. 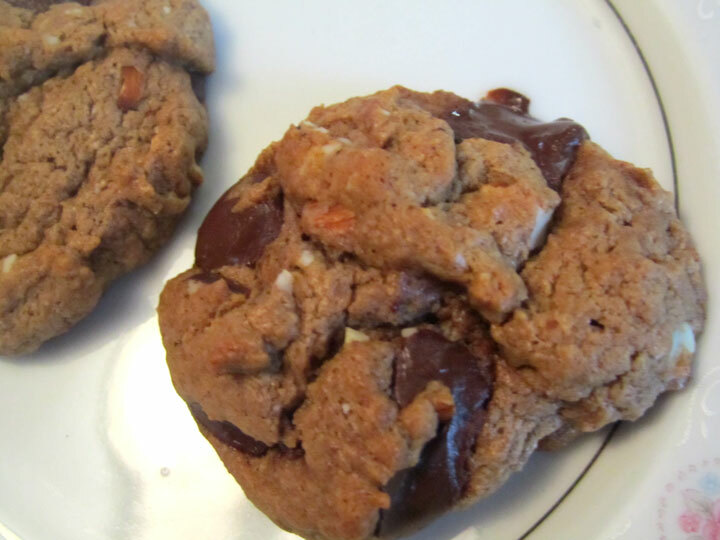 Use cookie cutters to cut dough into desired shapes, and place on parchment paper covered cookie sheets. Decorate as desired. Bake in preheated oven for 10-12 minutes, just until bottoms are starting to brown. Do not overbake. 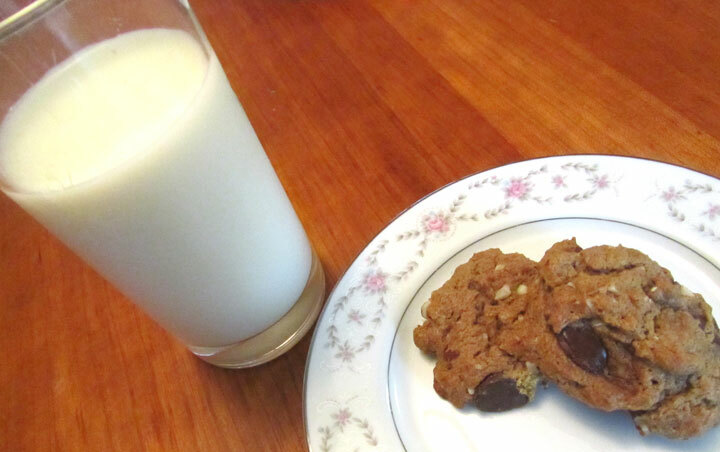 What kind of cookies do you like to make with your kids? 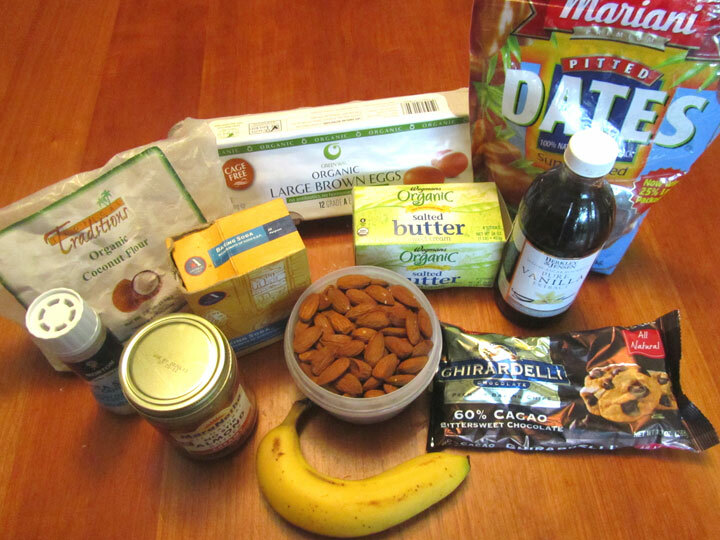 How have you adapted your traditions to a gluten-free lifestyle? Would love to read your thoughts in the comments below! I’m trying to reduce the amount of wheat I send in my kids’ lunches. While I’ve always tried to include milk and a vegetable, reducing the wheat is even more of a challenge, because it affects the easy sandwich. While I can use gluten free bread, I’m also trying to be a bit more creative and up the protein quotient. I have plastic sandwich boxes for each of the kids (no waste) and last year I purchased silicon cupcake cups by Wilton that fit inside the sandwich boxes and serve as flexible partitions for various foods. 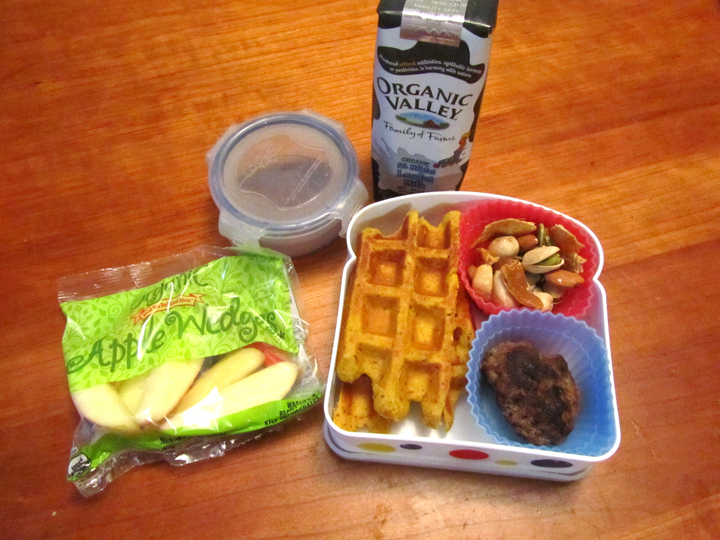 I also have a few convenience products for the sweet/fruit component of my kids’ lunches, but they are all organic and pure. 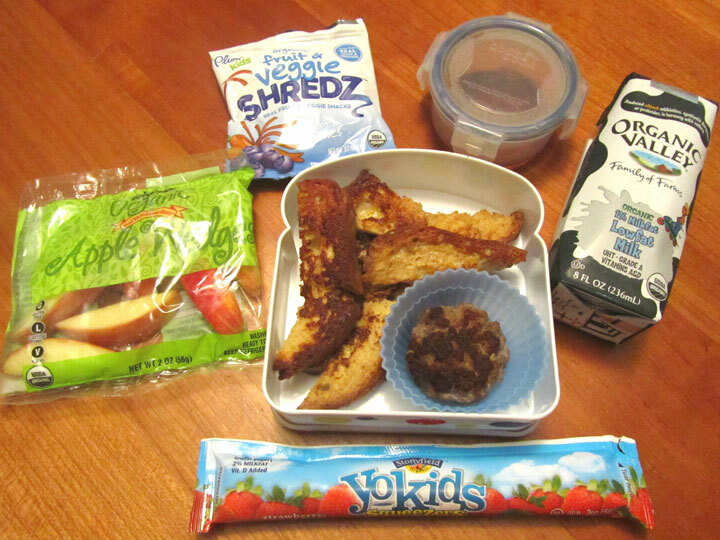 Here are some of the lunches I’ve sent with my kids. Served with 100% maple syrup for dipping, organic apple slices, organic yogurt, organic fruit & veggie shredz, and organic milk. Served with organic ketchup for dipping, organic carrots and cherry tomatoes, organic apple slices, yogurt (not organic this time…my mother in law bought it), dark chocolate square, and organic milk. 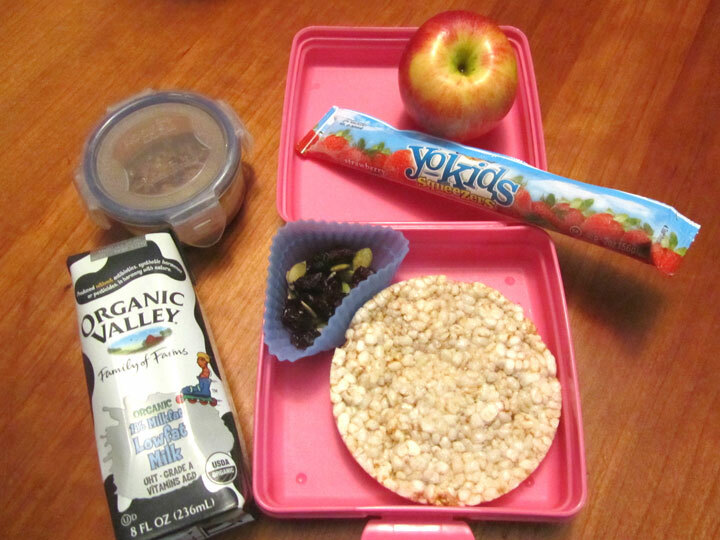 Served with an organic apple, organic yogurt, seed/dried fruit mix, and organic milk. 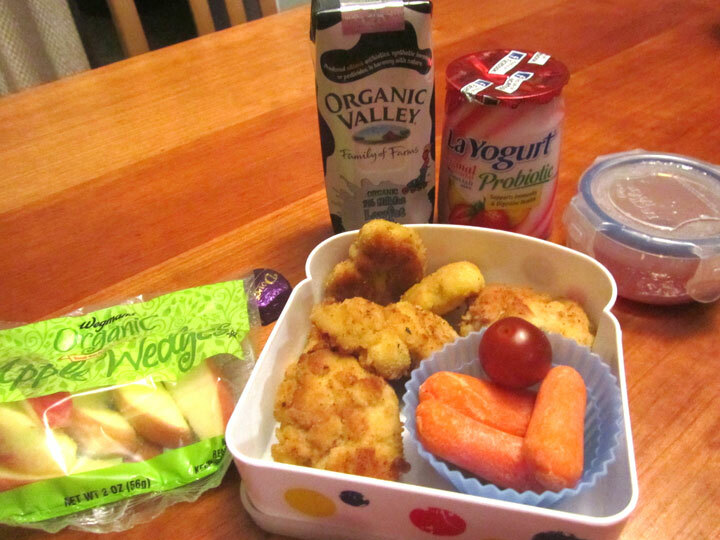 Served with organic carrot sticks, baby sweet pepper, Laughing cow cheese for spreading on the rice cake, string cheese, cashew and freeze-dried strawberry mix, organic fruit and veggie smoothie, and organic milk. 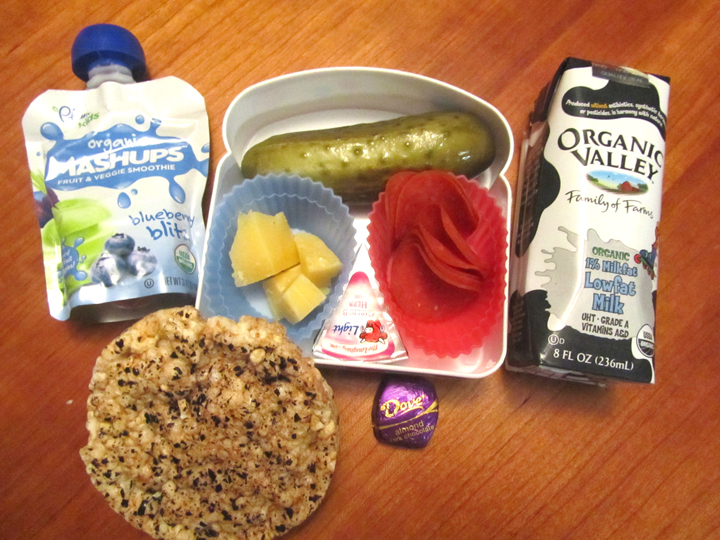 Served with dill pickle (from the farmer’s market), cheese (from the farmer’s market), Laughing cow cheese for spreading, organic fruit and veggie smoothie, dark chocolate square and organic milk. 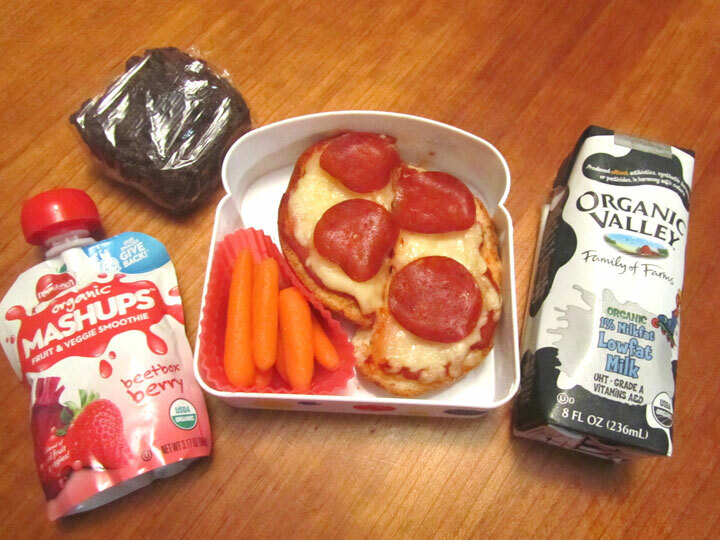 Served with turkey pepperoni, organic carrots, organic fruit and veggie smoothie, homemade fruit sweetened brownie (adapted from this recipe), and organic milk. Now obviously some of these lunches (but not all!) require some forethought. I tend to cook up a large batch of pumpkin waffles or french toast and chicken nuggets on the weekend, and freeze some for lunches for the week. Pizza bagels can be made in the toaster oven in the morning. 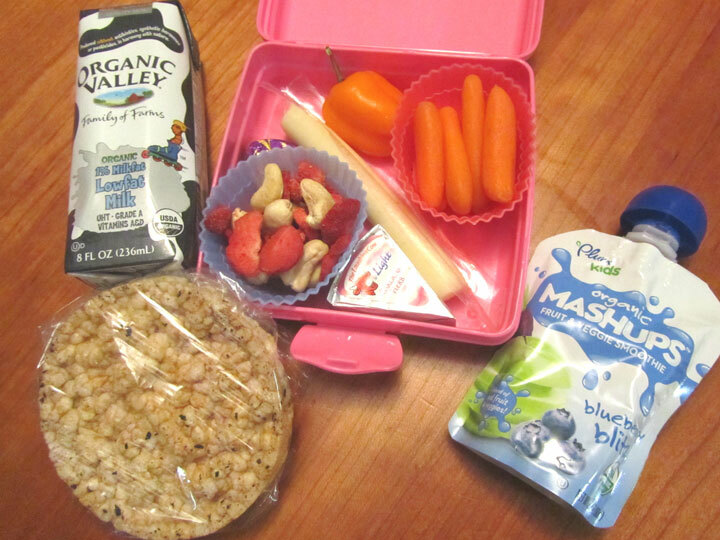 What do you send with your kids for lunch? It’s the beginning of October. 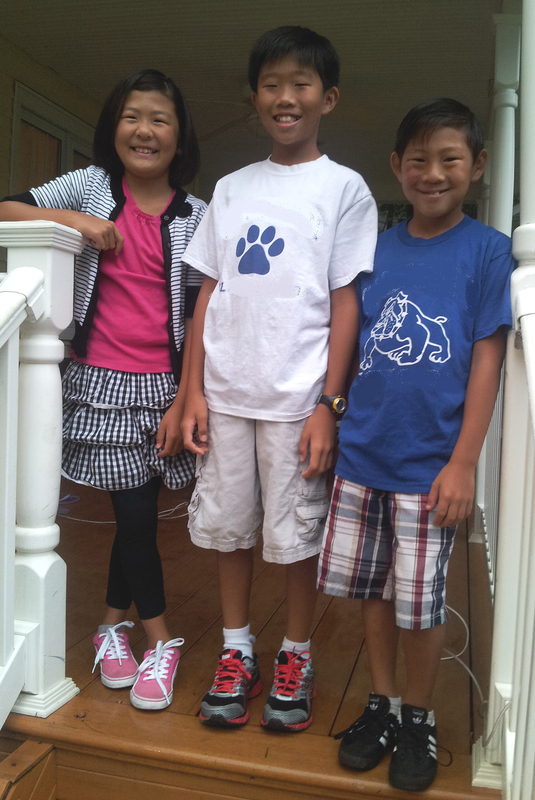 That means my kids are eagerly making their plans for the sugarfest more commonly known as Halloween. I live on a street that sees a LOT of kids on the 31st of October, and most houses are well stocked. When the kids come home with their loot, we carefully ration it out so that they don’t overload in a couple of days, but rather make it last for months. But even so, there’s a part of me (the part that doesn’t buy candy for my kids) that doesn’t really want to hand out candy. I don’t want it in my house, and the kids in the neighborhood are going to get more than enough of it. But I still want to participate in the fun, and I also don’t want my kids to have to deal with the reputation of being the house that hands out toothbrushes. So here are some suggestions for things you can hand out on Halloween that aren’t candy, but also aren’t lame, so your kids can show their faces in school the next day. Helium balloons. I still remember the one house we always tried to hit in our neighborhood on Halloween when I was a kid. They rented a big helium tank and handed out black and orange helium-filled balloons. 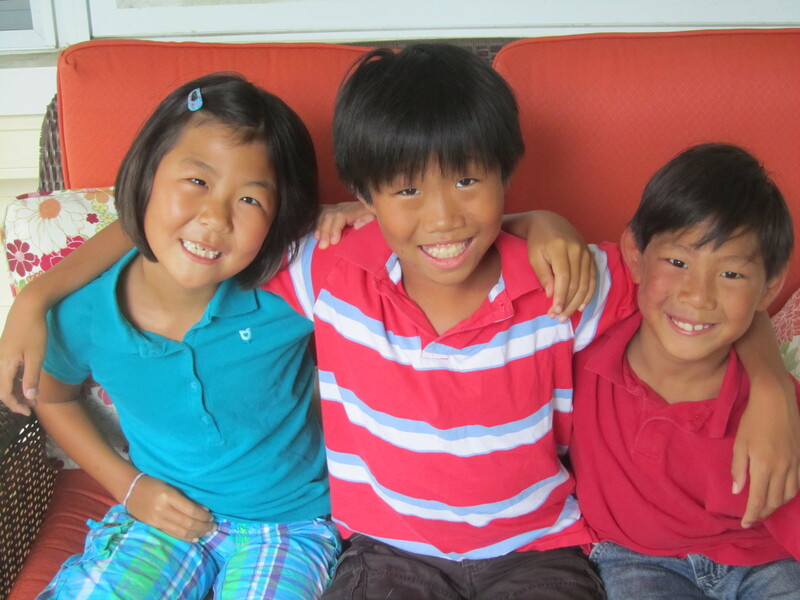 A glance into their house showed that they had balloons floating all over their living room. And you could tell every kid that had been there because they all had their balloon while they were trick or treating in the rest of the neighborhood. What a fun idea! Glow novelties. This is one I’ve done a few times, and it’s always a hit with the little kids, as well as the teenagers! I buy a bulk pack of glow necklaces, bracelets, or whatever I can find, and crack them so they glow right before trick or treating begins. 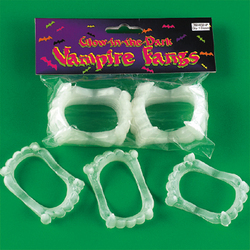 I’ve even seen glow in the dark vampire fangs! It’s especially nice at night, and gives a little more safety to kids as they wander the streets after dark. Organic fruit shreds. Now I don’t mean organic sugar sweetened gummies. But the ones that are basically organic fruit puree and nothing else added rank right up there with handing out gummy bears, in my opinion. I like this kind. Bubbles. Now this may go over better with little kids than big kids. But those little bottles of bubbles (same size they use at weddings) can be tons of fun. Coins. There’s one house I know of where they save up their loose change all year, and then hand it out at Halloween. Now this isn’t one you can use for self-serve. But if you’re willing to dole it out to each goblin at your door, this is always a good one. 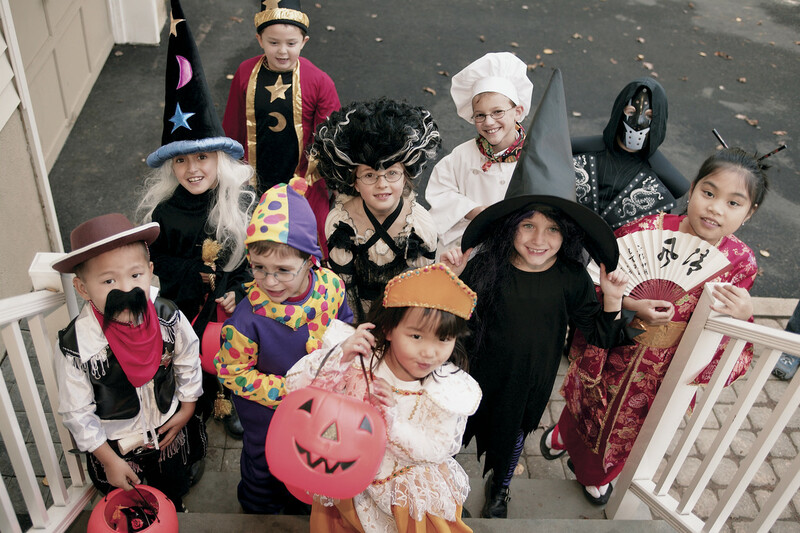 And if nothing else, you’re prepared for the kids that trick or treat for UNICEF. Individual sized microwave popcorn. Now I’m a little bit torn on this one, because I’m not super fond of all the chemicals in microwave popcorn, not to mention the fact that corn in the US is genetically modified. But if you’re trying to avoid sugar, we’ve done this in the past and it’s been well-received. What do you hand out at Halloween? Do you have additional suggestions? Please share them in the comments below!